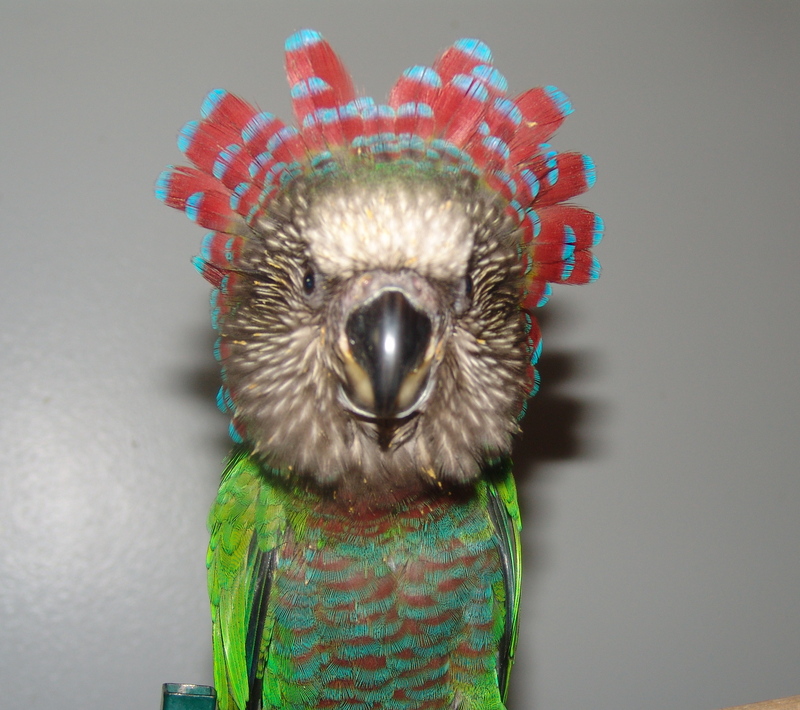 We hope everyone is as excited about the next Parrot Society meeting as we are. The topic of discussion is Bird, Body, Behavior; Increasing positive behavior in our parrots through observing body language. We think this meeting will be very important to everyone who wants to increase the positive relationship they have with their bird or who wants to change negative behavioral issues they are having. Reading and identifying a bird’s body language is one of the key factors in communicating and increasing a positive relationship with our companion parrots. If you reach out to touch me and I tell you “No!” you would probably pull your hand away from me. When we reach out to pet our bird or place our hand in front of them to ask them to step up, do they have the ability to say “No”? Many won’t verbalize it but if you pay attention to the details, if your bird doesn’t want to be touched or doesn’t want to step up, they will tell you with their body language. Often though these signs are overlooked and the hand becomes more forceful and many times so does the body language and a bite results. The bite is a pretty good sign of communication which is so easily trained and so frequently overlooked. In the next meeting on Monday, March 15th we will discuss these issues and talk about the details and the resolution to these problems, all the while increasing the relationship between the bird and the bird owner. A projector has been reserved so we can observe slides of different body postures in different species of birds to help us better understand what different body postures can mean and how they vary from species to species and more importantly, from bird to bird. If you have photos or videos you would like to send to us to share what your bird’s body language looks like or if you need help or suggestions in identifying body language, send your photos or videos to parrotsocietyofnwohio@gmail.com and send them in by this Sunday, March 14th to give us ample time to add them to the presentation for the following night. In the next meeting, we will also be discussing the planning of our first Parrot Society excursion or field trip. We have been in touch with someone well known in the parrot community and they have welcomed us for a visit to their facilities. Do you like parrots? Then you will really enjoy this excursion. Attend the meeting on Monday, March 15th and we will vote on a day in which to schedule this day long trip which most of us will remember forever. Don’t forget, our next meeting will begin at 6:15pm at the same location as last, The Sanger Branch Library on Central Avenue between Douglas and Secor. We know some people may not be able to come that early so we are reserving that time for round table discussion of anything bird. That’ the fun stuff! Promptly at 7 pm we will begin the power point presentation. If you can make it at 6:15 we can’t wait to see you. If you can’t make it until later, we’d love to have you whenever you show. This meeting will be much less formal than the last. We had limited time our first meeting which resulted in a more structured introduction of our group. This time, we are all letting our hair down and sitting back and looking forward to everyone getting to know each other and talk freely about what is bringing us all together…..our passion for our birds. See you Monday night! Remember, it’s free and everyone is welcome. Our goal is for everyone to be connected and interactive both online and in person at the meetings.